The Center for Ecoliteracy led a three-day seminar in Berkeley, California, to give teachers ideas, resources, and inspiration for bringing sustainability education into the classroom. Nourish added a food theme to the gathering, offering media and curriculum tools relevant to food literacy. Held at the David Brower Center, a LEED certified green building, the seminar brought together about 60 participants, including K-12 educators as well as college teachers and representatives from nonprofit and business sectors. The Nourish initiative provided scholarships for 10 educators to attend, representing school districts in Fresno, Los Angeles, and San Diego. The faculty included best-selling author, physicist, and Center for Ecoliteracy cofounder Fritjof Capra, executive director Zenobia Barlow, and other education for sustainability leaders. Building on the Center’s book Smart by Nature: Schooling for Sustainability, the seminar offered small group discussions, hands-on activities, a school garden visit, and reflective conversations. Kirk Bergstrom, executive director of WorldLink, introduced the Nourish initiative and screened the film. Afterward, participants broke into small groups to review modules from the Nourish curriculum, including the viewing guide and “Seasonal, Local Food” activity. 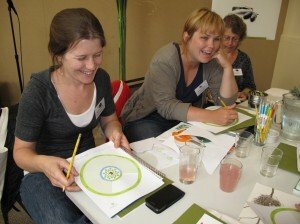 Spirited conversation filled the room as group members constructed food wheels to illustrate the cycle of seasonal food. All participants received a copy of the Nourish DVD and sample learning activities to bring back to their schools. “The film Nourish: Food + Community and the viewing guide inspired me to try something new with my students,” said one college English teacher.